WARNINGS: From Leeds United head coach Paul Heckingbottom. HEAD COACH Paul Heckingbottom is urging Leeds United to begin on the front foot against Sunday’s visitors Bristol City but is warning the Whites not to “open ourselves up” to pacy Robins threats on the counter. United face a hugely important fixture in Heckingbottom’s first Whites game in charge at Elland Road following last weekend’s 2-1 loss at Sheffield United. 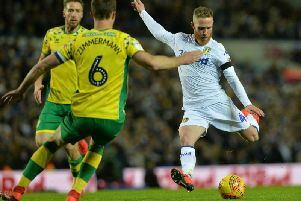 Leeds are now 11th and eight points off the Championship’s top six with Sunday’s visitors Bristol City occupying the division’s final play-offs position in sixth. The Robins have dropped down the table of late with Lee Johnson’s side having savoured victory in just one of their last seven league games, four of which have ended in defeat. Leeds, though, have picked up just two points from a last possible 21 and Heckingbottom insists City remain one of the best sides in the division, especially away from home. As such, the Whites head coach is wary of balancing the act of attacking the Robins from the off at Elland Road whilst also attempting to stay tight at the back. “They’re a good side,” warned Heckingbottom. “They’ve been one of the teams I’ve enjoyed watching this season. “They’ve ended up with a really good cup run, beat some really good teams on the way and they’re one of, if not the best team away from home until a short time ago so they’re a different sort of team when you play them away from home. You have to be wary of that. “They’ve got lots of pace and energy but what we can’t do is open ourselves up and be really vulnerable on the counter attack. “They pose all sorts of threats so they’ll be looking to stake their claim to ensure that they remain in a play-off spot and that’s the business end of the season we’re at, everyone’s fighting for points. Asked about the importance of beginning well and quickly stopping the rot of conceding early goals, Heckingbottom admitted: “It’s massively important. “Even if goals hadn’t been going in I think its something really important and it’s going to be something over time we want to address and we need to address for all sort of reasons. “When you’re playing at home you want to be positive on the front foot, making it hard for the away team. “When you’re playing away from home you just want to keep it tight but making sure you’re positive but not giving anything away.